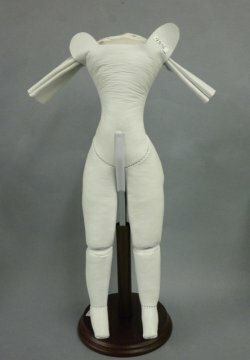 9-1/2" tall leather, fully stuffed body to make the 12" fashion doll so popular right now. Your porcelain arms will fit in the leather upper arms, and the leather pieces on the chest and back will fit over the shoulderplate. There are gussets under her fanny and in front of her knees. This is a beautifully made body.